Tobias A. Unruh: elder at Karolswalde; was born at Karolswalde, Polish Russia, 28 May 1819, the fourth of seven children of Andreas Unruh (1781-1857) and Anna (Koehn) Unruh (1781-1850). He was married to Helena Thomas (1821-1887) and they had three children (see additional information for further information regarding Tobias's family). Tobias died 24 July 1875 at Silver Lake, South Dakota, after suffering several weeks from typhoid fever, and was buried on 26 July in Marion. His schooling was meager, but Tobias had a broad knowledge and a deep understanding of the Bible. 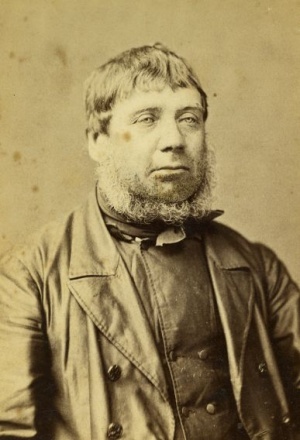 On 27 September 1853, he was chosen to the ministry and ordained as elder at Karolswalde on 15 December of the same year. He had oversight of eight villages with two church parishes, Karolswalde and Antonofka. Unruh was sent to St. Petersburg in 1871 to ascertain facts about rumors that reached the villages regarding the Mennonites being placed in the military ranks of Russia. In 1873 he was chosen as one of twelve delegates from Russia, Prussia, and Poland sent to locate favorable territory for settling in America. Upon his return after touring the United States and Canada for several months, he worked under many trials and difficulties, remaining in Russia until those of the church who so desired, both with means and without means, were brought to America. He arrived in Philadelphia with the last transport on 28 January 1875. The following spring he settled in Turner County, South Dakota. GRANDMA (The Genealogical Registry and Database of Mennonite Ancestry) Database, 5.00 ed. Fresno, CA: California Mennonite Historical Society, 2006: #70741. Unruh, Abe J. and Verney Unruh. The Tobias A. Unruh Biography, Diary and Family Record, 1819-1950. Pulaski, Iowa, 1950. The parents of Tobias were Andreas Unruh (1781, Karolswalde, Volhynia - 1857, Karolswalde, Volhynia) and Anna (Koehn) Unruh (1781 - 1850, Karolswalde, Volhynia). Tobias was married to Helena Thomas (30 July 1821, Karolswalde, Volhynia - 1 November 1887, Turner County, South Dakota), daughter of Jacob Thomas (6 August 1771, Brenkenhofswalde, Brandenburg, Prussia - 9 November 1851) and Ancke Beckers (b. 6 March 1783, Jeziorka, Schwetz, Prussia). Tobias and Helena had three children: Benjamin, Helena, and Peter. Unruh, Abe J and Richard D. Thiessen. "Unruh, Tobias A. (1819-1875)." Global Anabaptist Mennonite Encyclopedia Online. May 2007. Web. 20 Apr 2019. http://gameo.org/index.php?title=Unruh,_Tobias_A._(1819-1875)&oldid=163035. Unruh, Abe J and Richard D. Thiessen. (May 2007). Unruh, Tobias A. (1819-1875). Global Anabaptist Mennonite Encyclopedia Online. Retrieved 20 April 2019, from http://gameo.org/index.php?title=Unruh,_Tobias_A._(1819-1875)&oldid=163035. Adapted by permission of Herald Press, Harrisonburg, Virginia, from Mennonite Encyclopedia, Vol. 4, p. 786. All rights reserved. This page was last modified on 13 January 2019, at 18:50.